IT WASN’T SO long ago that Rio’s organising committee was ready to pull the plug on closing this Paralympic Games in traditional fashion. These are austere times for the movement and a Closing Ceremony was seen as an unnecessary extravagance. But this Paralympics, much like the Olympics which preceded it, has defied all expectations and battled against the odds to deliver a summer sporting carnival worth remembering. 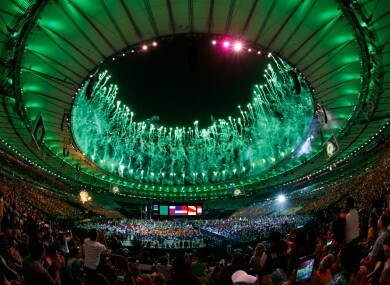 But this was a job well done in every aspect, culminating in a spectacular conclusion, featuring samba music, dancers and fireworks, to mark the end of six weeks of competition. It was an incredible turnaround from the uncertainty which mired the build-up to Rio’s 2016 staging of the Olympics and Paralympics. “These Games importantly signal a very bright future for this youthful and wonderful nation,” Sir Philip Craven, IPC President, said, adding that the people of Brazil had passed a difficult test. With ticket sales having defied the gloomy, and frankly depressing, pre-Games predictions, attendances soared and 2016 will be remembered as the second highest attended Paralympics behind London. Craven had declared this to be the people’s Games and they certainly responded. The people of this city know how to party and they showed it throughout. The loudest cheer of Sunday night was reserved for a video segment showing some of the highlights of the last two weeks. There were too many to even list, but enough memories to last a lifetime for those of us fortunate to be here. The Paralympics changes your perception and challenges your idea of what is possible. It is a tribute to the 4,300 athletes, who have overcome adversity, battled illness and pushed the boundaries we never knew even existed. It is a salute to the volunteers who travel from all over the world to create a truly unique, welcoming and warm atmosphere. And it is an invitation for us all to broaden our senses and reconsider the way we view disabilities and disabled people. Those who bought into the Games were rewarded with incredible athletic performances that were out of the ordinary. We were left in complete awe as the world was showed that with a positive attitude, the human body knows no limits. Those who disregarded it and considered the Paralympics as an afterthought are the ones losing out. These athletes are now heroes and role models, who defied expectations and rewrote the history books. Paralympic sport, whether it’s on the track, in the pool or on the tennis court, challenges convention. It is inspiring. And Ireland’s own heroes, who will arrive home to Dublin on Wednesday, took the world by storm again, winning 11 medals to finish 28th on the overall table. From Smyth and McKillop delivering glorious gold once again, to that wonderful Wednesday when four medals were won in Pontal and the pool and then the ‘Rebel Treble’, achieved by discus-throwers Orla Barry, Niamh McCarthy and Noelle Lenihan. But what truly defines success? Medals are the ultimate reward but simply being there is a triumph in itself for so many. You don’t meet a Phil Eaglesham or Declan Slevin or Pat O’Leary everyday of the week. However, amongst all the celebration there was a heartbreaking reminder of the fragility of life. As the 78,000-strong crowd fell silent, the Paralympic family last night remembered Bahman Golbarnezhad, the Iranian cyclist who tragically passed away on Saturday. Nobody should lose their life doing something they love. “Tonight is a celebration of the last 12 days of sport but it’s also a very sombre occasion following Saturday’s extremely tragic events,” Craven said. He will be forever remembered by the Paralympic family, as will Rio’s staging of the 2016 Olympic and Paralympic Games by the world. It’s over to you, Tokyo. Email “Letter from Rio: Adeus to a memorable Games which will live long for all the right reasons”. Feedback on “Letter from Rio: Adeus to a memorable Games which will live long for all the right reasons”.